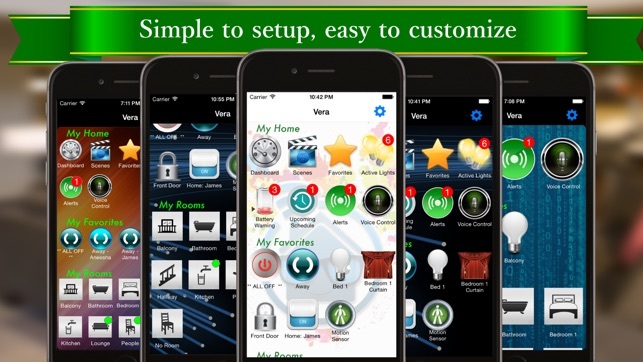 VeraMate is a simple but powerful home automation application to connect to your Micasaverde Vera controller. 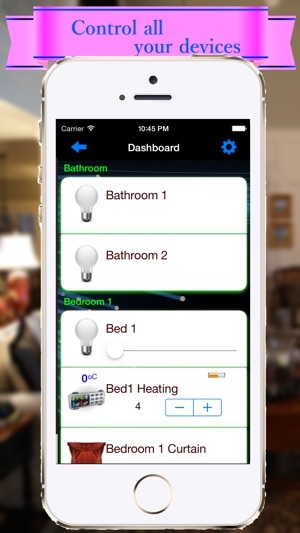 This allows you to control z-wave/X10 devices like your lights, curtains/blinds, heating, locks, and more. Apple Watch upgrade now available for purchase. VeraMate is designed to be a simple and elegant way to control your device. No setup is required, it simply connects to your Micasaverde box, and chooses the best configuration for you to control your home. The power is then in your hand to customize ! • Automatically activate scenes on leaving your home using GeoFences. 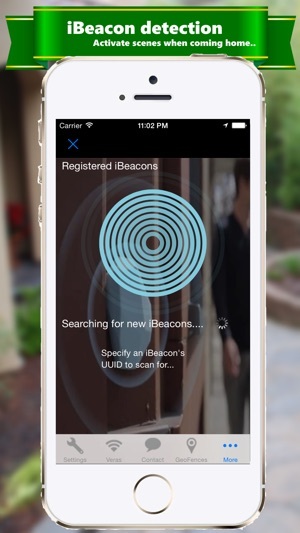 • Use iBeacons for indoor location sensing; turn on your lights as you walk in. 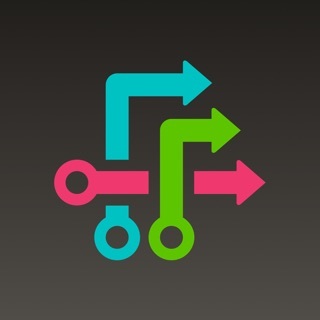 • Change your device icons to be more meaningful to you. Select from a wide range of custom icons, or download community built packages from the web. • Have alerts sent straight to your phone when your door opens. • Support for UI6/1.6.x and UI7/1.7.x firmware (please remember UI6/UI7 is not final firmware from Vera - VeraMate will attempt to support any changes that occur). • Multiple device support - store configuration in Google Drive to load your look and feel on another iOS device. 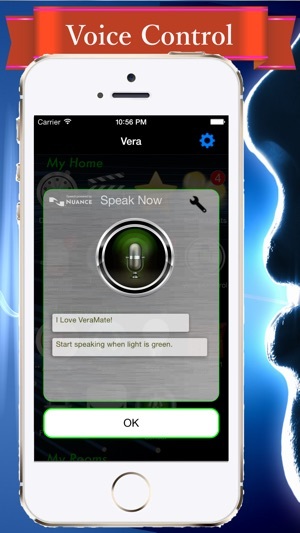 • Voice Control - control your home with your voice. This currently only supports English, with more languages to be supported in the future. • GeoFencing - activate scenes upon entering or leaving different physical locations. • iBeacons - indoor location sensing to interact with your devices via your iDevice (IOS7/8). 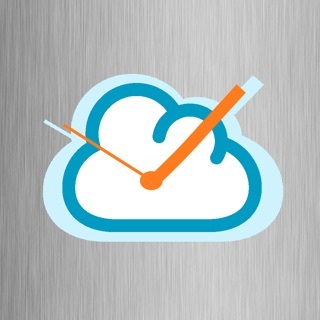 • Easy to setup Push Notifications - get alerts straight away when something changes. • NO setup required. It will load the settings based on your existing Vera. • "Smart buttons" - unique to VeraMate. Buttons that appear based on your usage. • Create shortcuts (anchors) for your most commonly used buttons. • Use your own icons for room images. Select from a wide variety of images. • Set different background images, including the ability to choose your own photos. • "Speak to Me". Speak the commands you make. (IOS7/8). • Support for virtually all devices. • Automatic switching between fast/slow (WiFi/3G) networks - no manual control required. • Hide items that you don't wish to see to prevent clutter. 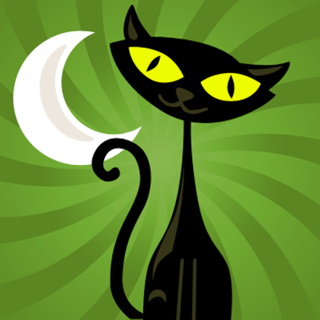 ** Please note, in-app purchases are not supported by iOS for family sharing. Better support for iOS 11. I have just a single lock which requires this box and software. I try to log in to do administration on our front door lock and am regularly met with issues (often from new software updates which appear to break many presumed features). Today I can’t even find the device configuration page to look at the Kwikset lock settings. I even considered paying (again) for the iPad version in the hope that device configuration might appear again magically for another $3 bucks (or whatever this upgrade cost is going to be) but others than the splash screen nagging me to upgrade, there is no way to go from the app to an upgrade that I can see. (I am a long time app user from original iPhone/App Store days and coded custom PC database applications much earlier in my career.) In the past, even when I get to the screen to adjust the attached Kwikset Smart Lock, I rarely have gotten lock changes successfully applied to the lock (much less email notifications). At this point, I am tempted to abandon the lock, z wave router and this software and start over again. We have a second home we need to configure in the next few weeks thanks to hurricane damage last year. I had hoped to use a single platform for both houses. After this past hour of frustration sitting here five feet from this lock with a rock solid internet connection and this app running in some crippled mode on my iPad Pro, a key with a deadbolt looks appealing again. I installed the free app to test voice control. I tried twice and it failed. The third attempt then said I needed to sign up for premium. The free version seems to be a bit of a racket to try and get money. I have no problem paying for an app but do like to try the free version to make sure it will be worth it. Because the free version does not work, I will not be fooled into spending money. This app is hands down much better than Veras. I can view all 6 of my thermostats and I can control them without difficulty.